As part of the process of relocating the collection of the Sarjeant Gallery Te Whare o Rehua Whanganui to its temporary home on Taupō Quay, to allow for earthquake strengthening and redevelopment of the heritage building, some wonderful rediscoveries have been made. Among the collection items that have been brought to light are a group of four hand-painted duck egg shells depicting birds against a background of rockwork, trees and flowers all rendered in brilliant colours. When I first encountered these miniature paintings they were housed in a glass cabinet in the Queen’s Park collection store, hidden from sight in a small cardboard box addressed to the Gallery (complete with the original postage stamp). From that first encounter I knew that I needed to know more. 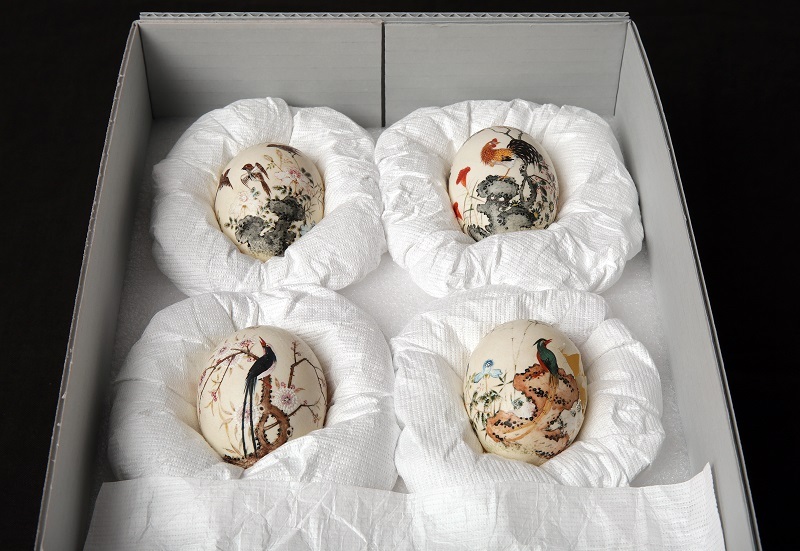 The journey of discovery started with the Gallery’s accession files, which revealed that the eggs were collected by a New Zealander who visited Peking (modern day Beijing) in the early twentieth century. They then passed into the Gallery’s care in 1944. A close examination of the objects themselves revealed small slips of paper bearing Chinese characters affixed to each of the shells. These record the name of the artist Zhou Peichun. In order to find out more, I approached a number of international experts in Chinese art but very little is known about the artist’s life or career other than the fact that he had a studio in Beijing from around 1880 to 1910. A valuable lead concerning the history of our eggs was suggested by Yiyan Wang, Professor of Chinese at Victoria University of Wellington. She noted that, with the exception of painting eggs red to celebrate someone’s birthday, the Chinese do not have a tradition of egg painting. Instead, the works in our collection were likely produced as commercial art objects for foreign tourists, a practice that started in Guangzhou (Canton) in the late nineteenth century and later spread to Shanghai and Beijing. Another aspect of the eggs that intrigued me was the subject. Depictions of flowers and birds are one of three major traditions in the history of Chinese painting, dating back as early as the Five Dynasties (907-960). When looked at from a Chinese perspective, each of the birds and flowers depicted are imbued with their own significance. The magpie, for example, is considered by the Chinese as a harbinger of happiness and good fortune, while the blossoming plum tree in which it is perched signifies impending good news. A similar message is conveyed by the other paintings, with both the cockerel and the sparrows acting as signs of good luck, while the pheasant is a traditional symbol of beauty and good fortune. Relocating the Gallery’s collection has not only enabled us to reconnect these beautiful delicate pieces with their history, but also to rehouse them. Today they can be found in a custom-built storage box, where they have been individually ‘nested’ to ensure their long-term preservation. The author would like to thank Yiyan Wang (Victoria University), Claire Roberts (Australia National University), Dr Clarissa von Spee (The British Museum), Dr Hongxing Zhang (V&A), Nancy Berliner (Museum of Fine Arts, Boston) and Daisy Yiyou Wang (Peabody Essex Museum) for their assistance.